2011 Suzuki B-King. Picture credits - Suzuki. Submit more pictures. Featuring a slightly modified version of the Hayabusa�s engine, complemented by state-of-the-art chassis and suspension systems, the B-King offers incredible all-around capabilities - breathtaking acceleration matched by precise, responsive handling. Price as new (MSRP): US$ 12899. UK � 8999. Prices depend on country, taxes, accessories, etc. Instruments: Analog tachometer, digital speedometer, fuel gauge, water temperature gauge, twin tripmeters, clock, maintenance interval, running time, average speed, gear position indicator, and a S-DMS mode indicator. Factory warranty: 12 month limited warranty, unlimited mileage. 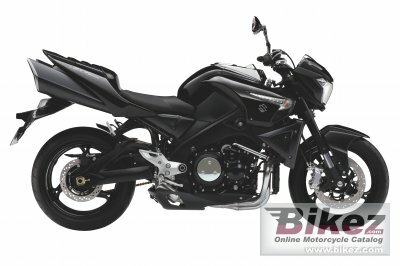 Ask questions Join the 11 Suzuki B-King discussion group or the general Suzuki discussion group. Bikez has discussion forums for every bike. View comments, questions and answers at the 2011 Suzuki B-King discussion group. You can sign up for e-mail notifications when other riders answer you. If you have extensive experience with the MC, please send us a review. If you consider buying this bike, you should view the list of related motorbikes Look at photos. Compare technical specs. And check out the rating of the bike's engine performance, reliability, repair costs, etc. You can compare the rating with other bikes.